With Thanksgiving fast approaching, so many are planning their Holiday menu! I always have trouble finding a balance with cooking everything on the stove or oven! Having a non-cook recipe for a side dish that is super flavorful makes this cranberry relish a real winner! 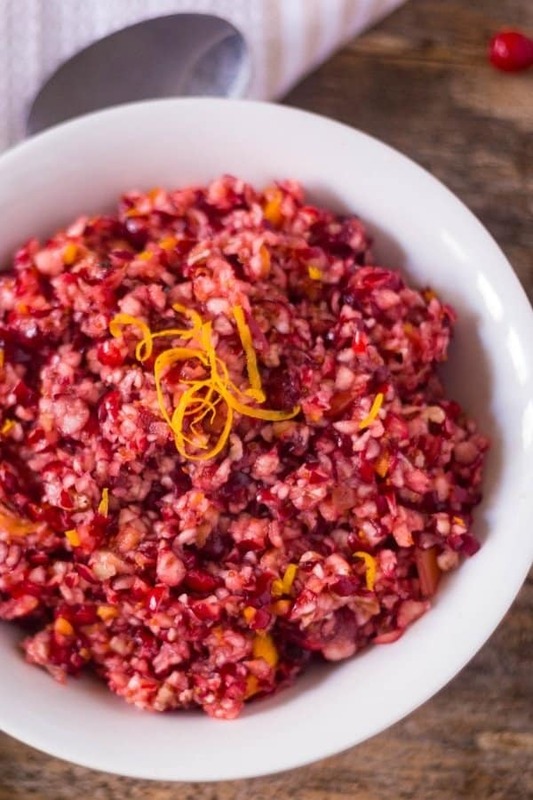 This delicious Cranberry-Orange Relish has been part of my Thanksgiving menu for years! Its a matter of tossing a few ingredients into the food processor and done! 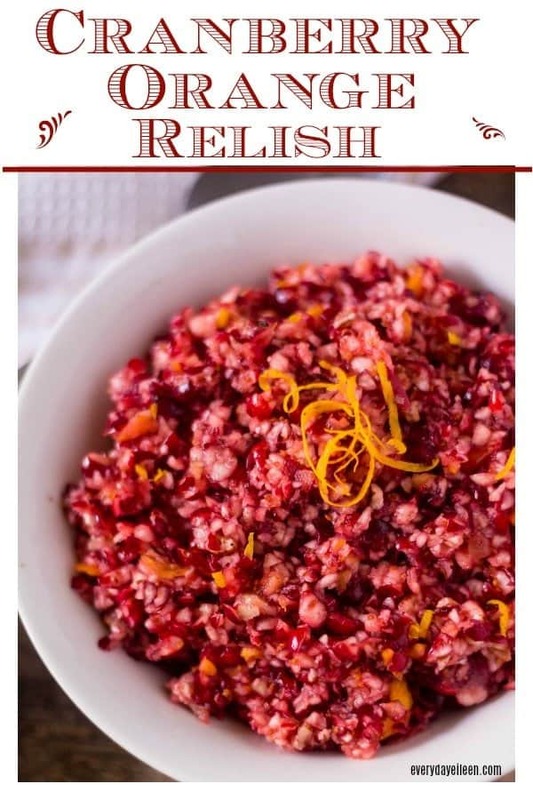 Easy peasy, so quick and easy Cranberry Orange Relish is one of those for everyone to make, regardless of your cooking skills. So sign up now to bring it to your family celebration. 5 minutes and 6 ingredients and you are done! SShhh, I won’t tell if you won’t tell how easy this is to make either! There are a million cranberry relish recipes out there! Why make this recipe? Well, let me tell you, it’s just darn delicious! 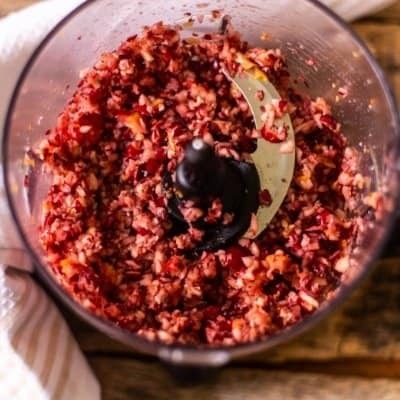 With just a few ingredients, you have the best and tastiest cranberry orange relish out there! What are the ingredients to make cranberry orange relish? Can Cranberry Orange Relish be made ahead of time? Yup! Using fresh cranberries, feel free to make cranberry relish 2 days ahead of time. The flavors are best made ahead at least overnight for this relish. 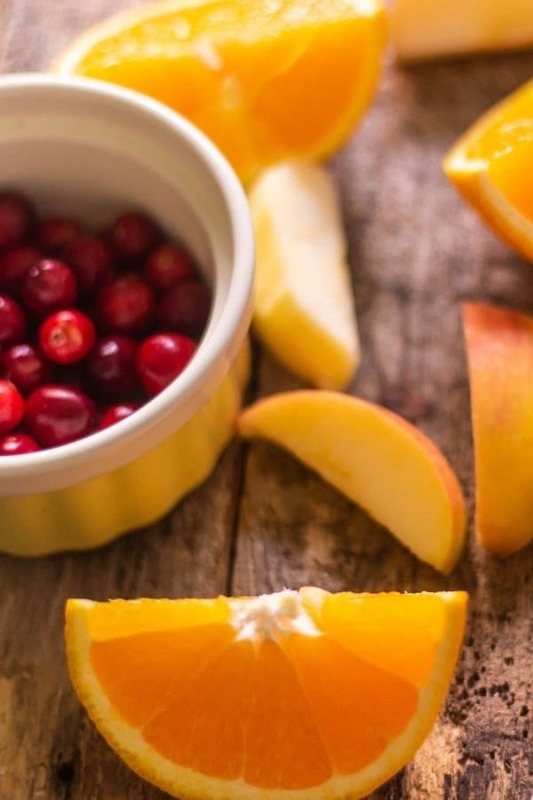 What other recipes can you use cranberry orange for? Make a sandwich or panini and add the relish. What is the difference between cranberry sauce and cranberry relish? Cranberry sauce is usually cooked with similar ingredients on the stovetop. Cranberry relish uses fresh cranberries and is not cooked! Can Cranberry Relish be frozen? Using fresh cranberries makes it possible to freeze this relish. I use ice cube trays to put a couple of teaspoons into each cube so I can use the relish at a later date. I also have a store where I am always updating great finds for not just cooking, I hope you check it out here, Everyday Eileen I will continue to update it regularly! Click here to read my full disclosure policy. Thank you so very much for being apart of Everyday Eileen! I use this food processor and I love it! Crystallized Ginger really adds a nice depth of flavor to this relish! Into a food processor add fresh cranberries, an orange cut up, skin on, an apple that has been peeled and cored, pecans, and crystallized ginger. Pulse until chopped well chopped. Store in the fridge overnight, well covered to allow flavors to blend. 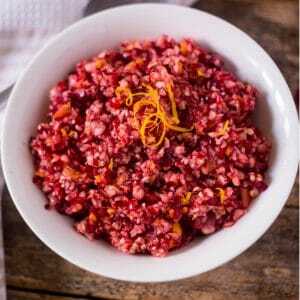 A fresh cranberry relish is a no-bake side dish! Add this to your Thanksgiving or Holiday menu for a crowd-pleasing dish! The leftovers make a great addition to sandwiches and smoothies. Use your imagination! 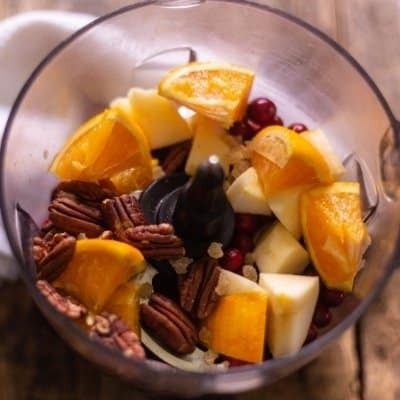 Into a food processor, add cranberries, orange pieces, the chopped orange zest, chopped apple, pecans, and crystallized ginger. Pulse the food processor a few times. It usually takes me about 10 pulses. Check the consistency of the ingredients. They should be chopped and fairly even. Add in the sugar. Start with the 1/3 cup of sugar. Test the flavors. If sweet enough, excellent. If not, add more sugar to your preference. Transfer the cranberry relish to a covered container and store in the fridge until ready to serve. Note 1: before slicing the orange, zest the orange. Chop half the zest up and add into the food processor. The second half of the zest will be a garnish for the completed cranberry relish. Note 2: Crystalized ginger is optional because some find it hard to find. It can be ordered from Amazon, I have provided a link. I love the addition of the ginger to the relish! Note 3: Add 1/3 cup of sugar and test the cranberry relish. I find the relish is usually sweet enough and no additional sugar is needed. It depends on the tartness of the fresh cranberries. Note 4: Cranberry Relish can be made ahead about 2-3 days well covered in the fridge. Tried this recipe?Mention @Everyday_Eileen or tag #everydayeileen! We love it! Made it for Thanksgiving! Delicious and easy! I could eat it all before tomorrow! Thank you very much Kate for taking the time to let me know that you enjoyed the cranberry relish! I am so happy you enjoy the recipe! Wow, I made this today for our Thanksgiving Celebration. It was super easy to make and absolutely delicious! Thanks for the recipe! Fantastic Kate! I am glad you enjoy the recipe! Thank you so much for letting me know how the recipe worked for you! Thank you for rating it also! Much appreciate you taking the time to comment! Happy Thanksgiving! I’ve never made cranberry relish before but I’ve heard so many good things about it! Your version sounds so simple and delicious! I hope you enjoy making cranberry relish, it is delicious! Love the idea of using this to top oatmeal! Thank you Jolene! The Cranberry relish is tasty on oatmeal too! So quick and easy…what a great little side dish! Thank you Colleen! I hope you enjoy the relish! This is a gorgeous looking relish and I love that there are 3 fruits in it. Thank you so much Wendy! As one of my first recipes at age 9, I am so glad my family and others like yourself enjoy this relish! DON’T MISS A RECIPE! ENTER YOUR EMAIL TO RECEIVE NOTIFICATIONS OF NEW RECIPES!